Fall is here and Halloween is fast approaching, which can only mean one thing. Pumpkins are rising! Those orange little orbs are popping up everywhere; you may have even gone to a pumpkin patch to pick out that perfectly shaped pumpkin to carve. You’ll come home, set it down on some newspaper and scoop out the goop. But then what? Most people throw the goop away, but not here at Pathways.org! Instead of just throwing away the pumpkin goop, create a pumpkin sensory bag. This is the perfect fall craft for little ones that is easy and they will love! Bonus: it also helps tune their fine motor skills and sensory play! So here is how to get started on how you create this fun and easy craft. After you cut open the pumpkin and take the top off, you can have your child look at the contents inside. They may not be too keen on touching the inside, but this bag is the perfect way to introduce the different parts of the pumpkin without having to actually touch the goopy insides. Draw a jack o lantern face on the bag! As the bag fills up, it will look like another pumpkin is coming to life! Scoop out the inside of the pumpkin into a gallon size Ziploc bag. Once the goop is inside the bag, seal it with some tape at the top for extra security! They can squish around the goop in the bag, which is great for their sense of touch and understanding what the inside of a pumpkin feels like. You can also have your child count how many seeds are in the bag, push the seeds around, or trace the outline of the jack o lantern face. Pushing seeds around and tracing the shapes of the jack o lantern face helps with children’s fine motor skills! 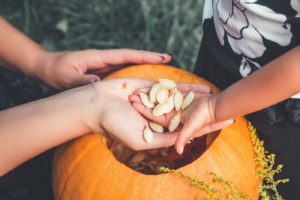 Many kids will love squishing the pumpkin goop around, but some kids may be hesitant to touch the actual goop. This is a great way to introduce the contents of a pumpkin without them actually having to touch it or getting overly messy! Candy and costumes are great, but there is more than one way to appreciate the Halloween season. We’ve thought up some additional Halloween activities your family can enjoy before and after the one night of trick or treating. 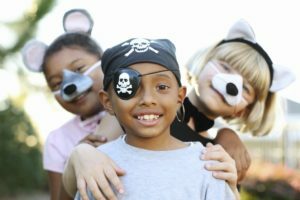 Halloween can be a fun time of year for children. They get to dress up, eat candy, and carve pumpkins! But for a child with a sensory issue these experiences can be stressful. 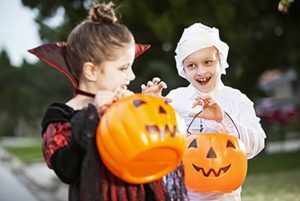 Use these tips for sensory-friendly Halloween.